Closing the gap is among the clearest popular accounts of maths I've read in a while. It's about prime numbers, as the title suggests, but it's also a master piece in the art of weaving. Apart from exploring the mathematics, the book gives an intimate description of the process of doing maths as experienced by those who do it every day, and an account of a particularly exciting, and recent, period when prime number theory made some great leaps forward. And it's a look at a completely new way of doing mathematics: in large online collaborations that anyone can join. So many strands are a recipe for a tangled mess (that's personal experience speaking) but Neale has turned the multi-layered nature of her story into a strong point of the book. Some of this is anchored in its structure. Chapters alternatingly look at the actual maths, with no interference from the real world, and at the very real events that unfolded between April 2013 and April 2014, during which some major advances were made. This way of structuring the book isn't a gimmick, as I feared at first, but probably the best way of getting both parts of the story across. Adding to the clarity in structure is Neale's calm, unhurried, and very personal voice, which holds your hand throughout. Mathematically the book focusses in the famous twin prime conjecture which asserts that there are infinitely many pairs of primes whose difference is 2 (you can read more about this conjecture on Plus). The fact that the conjecture can be stated in a sentence illustrates one of the advantages of number theory when it comes to popular mathematics. Many of its central problems can be easily explained even to a maths phobe, and pretty much anyone can start playing with numbers to see how far they get. On some questions, you can get satisfyingly far with a relatively small mathematical tool kit. But on others, including the twin prime conjecture, you soon hit a brick wall. 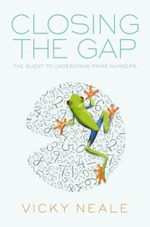 The tricky nature of prime numbers, which form the building blocks of number theory, is explored in the chapters that focus on the maths alone. Neale introduces the subject from scratch and invites the reader to play. If you like puzzling over maths problems, or feel you need a break from the author's guiding hand, you can go away and scribble for a while, until you're ready to get back to the book. The problems and results are carefully chosen to illustrate the treacherous nature of the subject, and also to provide some surprisingly deep insights into the maths used by those at the cutting edge of the field. If you'd rather give the puzzling a miss, then you can let yourself be guided through the maths and focus on those chapters that describe how recent advances on the twin prime conjecture came about (some of the harder maths can safely be skipped). As hard mathematical problems go, the twin prime conjecture is unusual in many ways, but in the context of the book it serves as a great example of how progress in pure maths comes about: not only through great theoretical leaps, but also through incremental improvements, the testing of boundaries, blind alleys and experimentation. Imagination, intuition, the ability to ask good questions and spot pervasive patterns, and the courage to get stuck are essential in this. Closing the gap is firmly aimed at a general audience. A desire to share with non-mathematicians the pleasure, frustrations and excitement of doing maths, to shed some light on this all too secretive process, seems to have been one of Neale's main motivations for writing the book. She is unapologetic about the maths, so be prepared to think, and think hard in places. If you are already well-versed in mathematics, the book also has something to offer. It gives some insight into what's happened in number theory in recent years, at least as far as the twin prime conjecture is concerned. Above all, it will give you an interesting insight into the Polymath project, which has seen mathematicians bare all in public (metaphorically) to see if large and fast online interaction can bring the subject forward — with very interesting results. I won't give too much away by saying that the gap between primes hasn't been closed sufficiently to prove the twin prime conjecture — not yet. For Neale this means that writing the book has been a bit of a gamble. Had the conjecture been proved just as she put the finishing touches to her manuscript, she would have had a whole lot of rewriting to do. As it stands, she has left us dangling from a cliff. As progress in mathematics goes, we may stay dangling there for a few decades. But if we're lucky, perhaps by next Christmas Neale will be able to provide us with a concluding sequel.